The Odeon cinema in Dunfermline is continuing to thrive – with an average of 10,000 film-fans visiting each week. 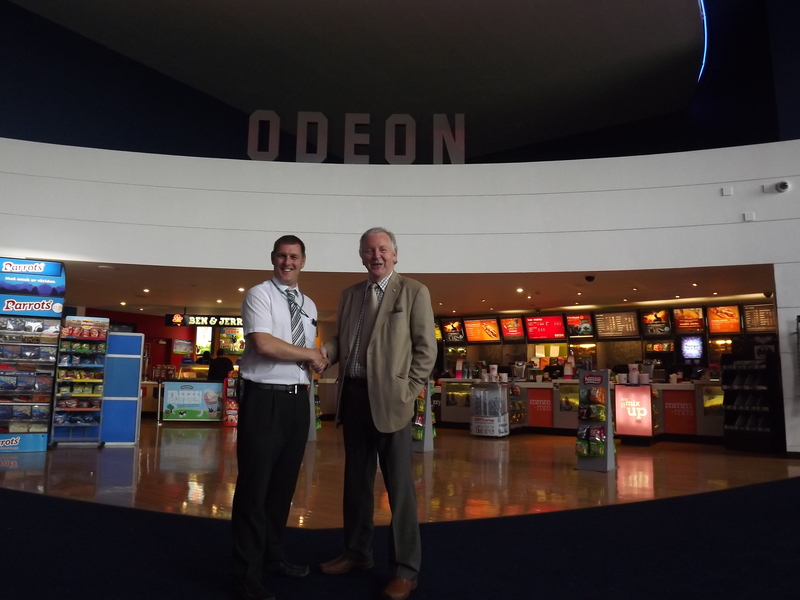 Assistant Manager, Kenneth Syme, gave Dunfermline MSP, Bill Walker, a behind the scenes tour when the Cinema Exhibitors’ Association recently invited Mr Walker to discuss the benefits the cinema brings to the local community. Mr Walker said: “The Odeon is of course a very impressive cinema, with ten screens and the capacity to seat in the region of 2,400 visitors at any time. As the largest cinema in Fife, it draws visitors from all around. “But what I find particularly interesting is the potential of cinemas, the Dunfermline Odeon in particular, to bring a wider boost to the local economy. “For example, after seeing a film, over a fifth of the audience will go for a meal or drink and almost one in ten will go shopping. The Dunfermline Odeon is very well-placed for this – Fife Leisure Park has an excellent variety of eating establishments, as well as Bowlplex, Bannatyne’s, Carlton Bingo and Dobies. Here, we see businesses bringing each other custom. “Cinemas also spend around 42 to 62 per cent of their total annual expenditure on local goods and services, such as staff costs, maintenance and catering, which again is a tremendous boost to the economy. “In terms of catering for the community, the Odeon seeks to meet the requirements of different groups. Senior Screen offers the over 60s discounted tickets and even a free cup of tea or coffee from Costa, and it screens modern and classic films that focus more on story than on action. “For teenagers, the cinema provides a safe environment to meet friends, and parents don’t have to worry where they are. As with other age groups, they can take advantage of discounts such as Orange Wednesday. “As for fans of sports and cultural events, they can now enjoy live streaming of Wimbledon, opera and musicals on the big screen. “I enjoyed my behind the scenes visit to the Odeon and even got a quick glimpse of Brave! The Assistant Manager, Kenneth, is very professional and hospitable. He’s a local man who gained his HND at the old Fife College. Since he has already seen the move from 35mm film to digital, I wonder what the future holds next.